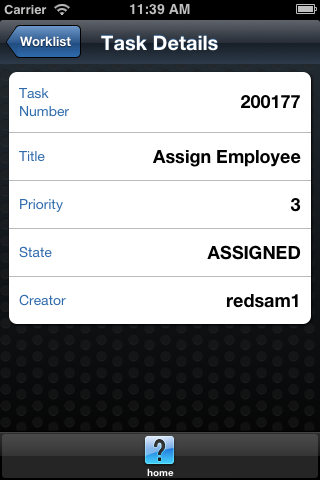 I have developed ADF Mobile application to bring BPM worklist tasks to the mobile device - I would like to share concepts of such ADF Mobile application with the community. 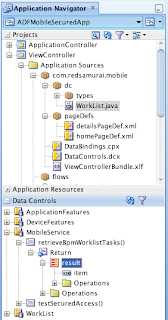 The whole idea is based on BPM Java API to access BPM Context and get currently assigned tasks for the user, read more here - Lightweight ADF Task Flow for BPM Human Tasks Overview. 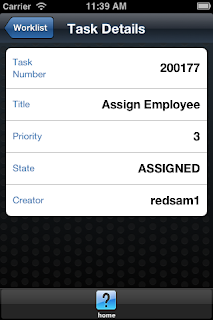 Once tasks from BPM are queried, they are exposed through ADF BC secured Web Service method. 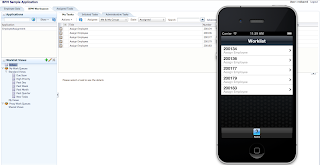 Web Service is consumed from ADF Mobile application through Web Service Data Control - task data is rendered on the mobile device, later user can do callback and send approve/reject actions. 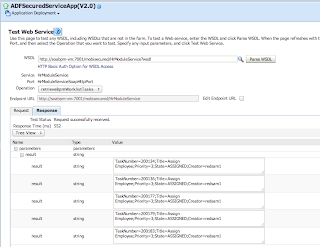 Approve/Reject actions will be processed by BPM API on ADF BC secured Web Service side. 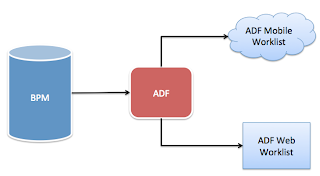 ADF Mobile login and secured Web Service call implementation is done based on previous blog - ADF Mobile - Secured Web Service Access. 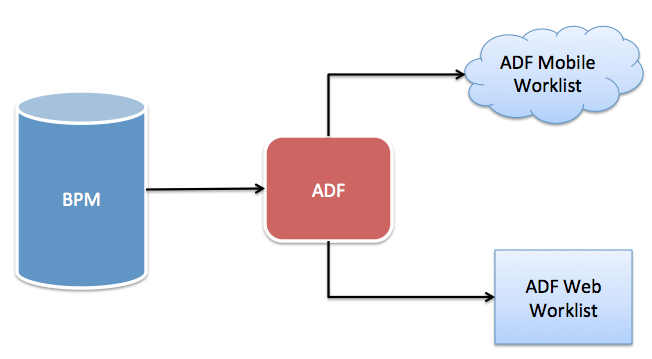 ADF BC secured Web Service is implemented and deployed based on this post - Web Service Interface for ADF BC Application Module in Oracle Fusion 11g. 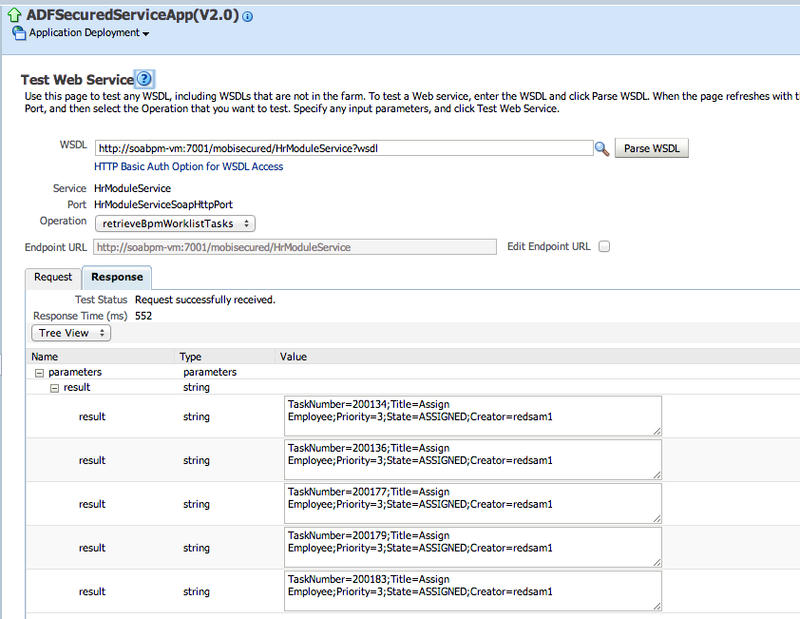 Instead of using the API and then exposing it as secured web service.. why don't we use webservice exposed for worklist directly? Let me know any drawbacks using it? Accessing Web Service from Human Task is good also. But in my experience, in practice it makes it easier to publish your own Web Service and isolate access to BPM through Java API. 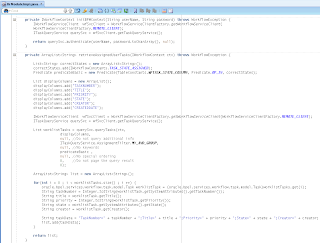 This allows to control entire solution in more transparent way, centralized into server side API. 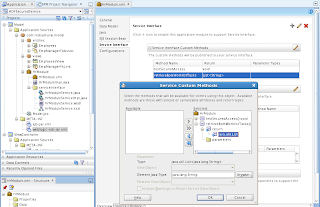 Other thing, you may hit a bug with out of the box Human Task Web Service and as it happens it will be much harder to workaround it comparing to your own Web Service. 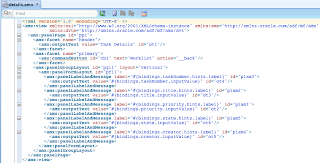 With API it is easier to implement data caching in between. 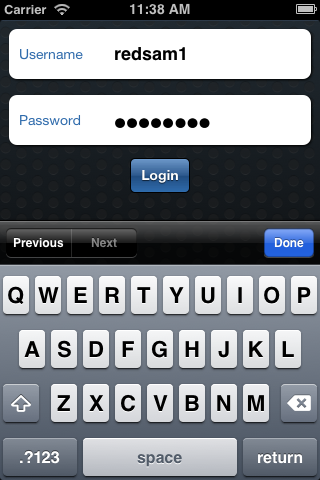 Without getting logged-in user's context this doesn't looks like a working solution. 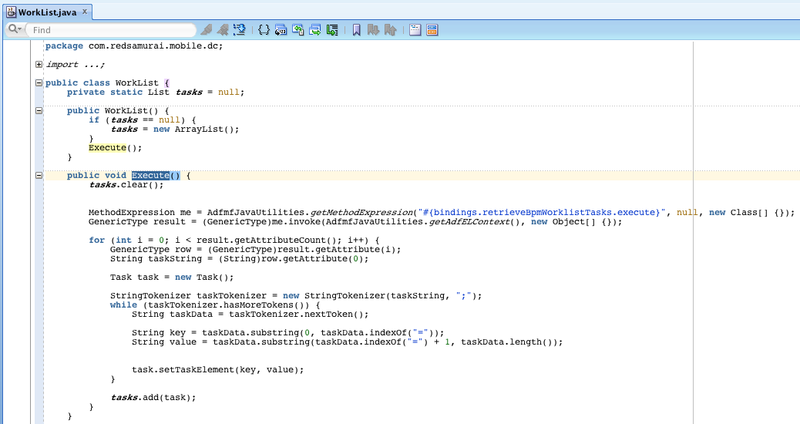 As you can see in sample app, I'm getting username dynamically from ADF Security Context. 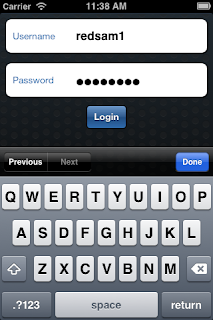 Regarding password - you need to get it from your enterprise security management system. Could you please throw more light on how to get password from enterprise security management system or some docs pointing to it. 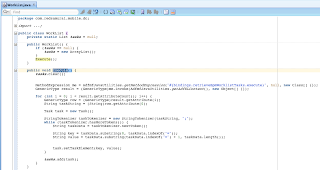 Is it possible for you to give a step-by-step instruction on deploying and connecting this application to a running BPM environment? How to handle the approve/reject part through mobile? 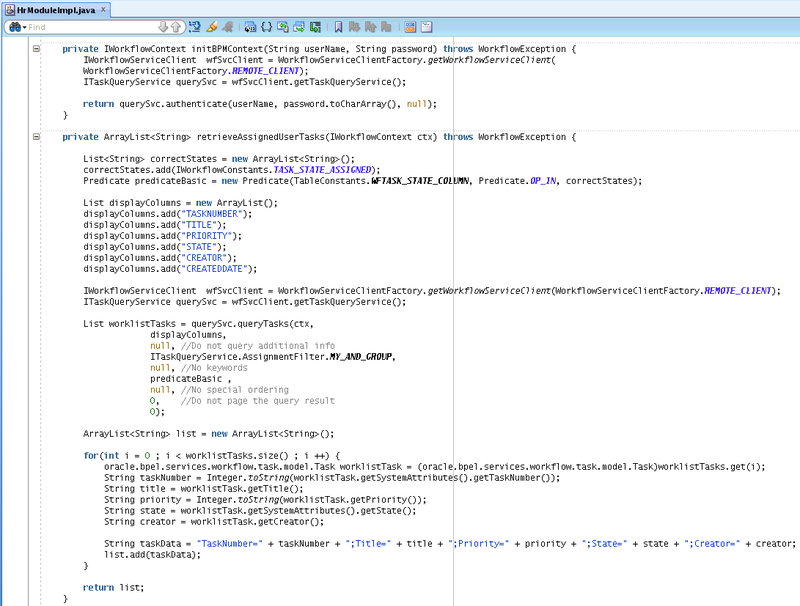 My ADF Secured APP runs fine and I'm able to display the tasks from my SOA Server on the table with the RetrieveBPMTasks method. First of all, thanks a lot for the awsome tutorials...this is helping me alot! 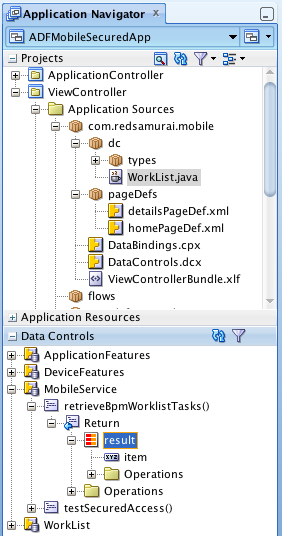 I got a small question, since I'm new to ADF, after invoking the WS as Data Control on the mobile, whats the next step for separating the String into a java class? 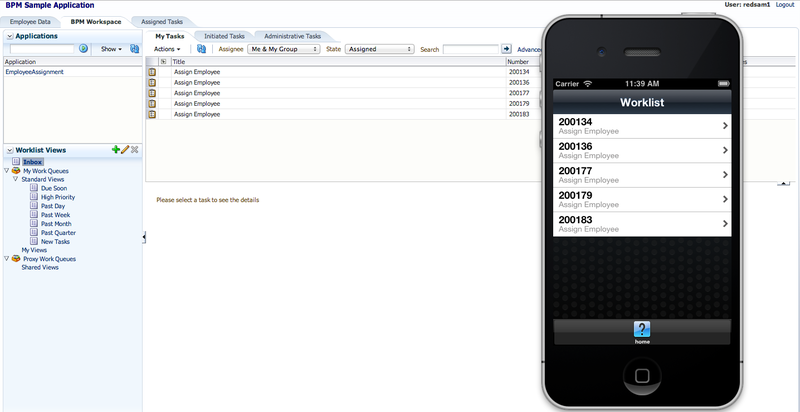 Next steps are creating 2 classes(task and worklist) and generating data control of worklist? 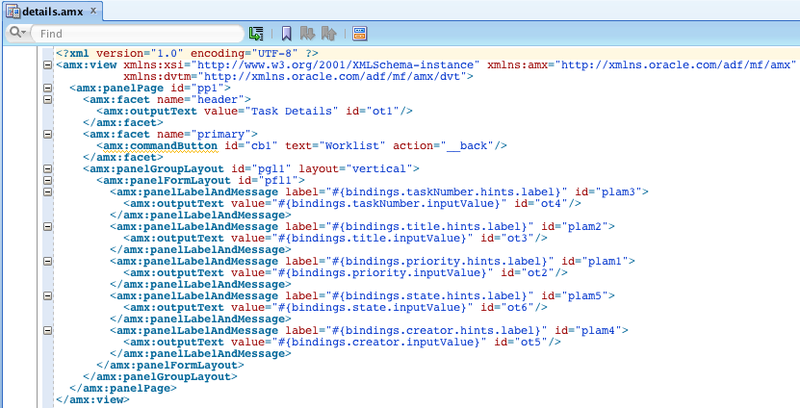 Task.xml is auto generated, you can generate it from Data Control. I did every step, but I can't seethe tasks on my mobile, and I think I know what the reason is, despite the weak error message. On my mobile appears a red error box saying "retrieveBPMWorkLislTasksWithKey". Yeah, my method as an aditional "with key" because I'm using 2 atributes as parameters to use on the query...the problem should be coming from there right? Hmm, sorry if this is too obvious, but I can't understand. I don't want to implement data caching, I just need to transform the String result into diferent atributes using the java bean. Since my method got 2 params, I probably got to change something here no? 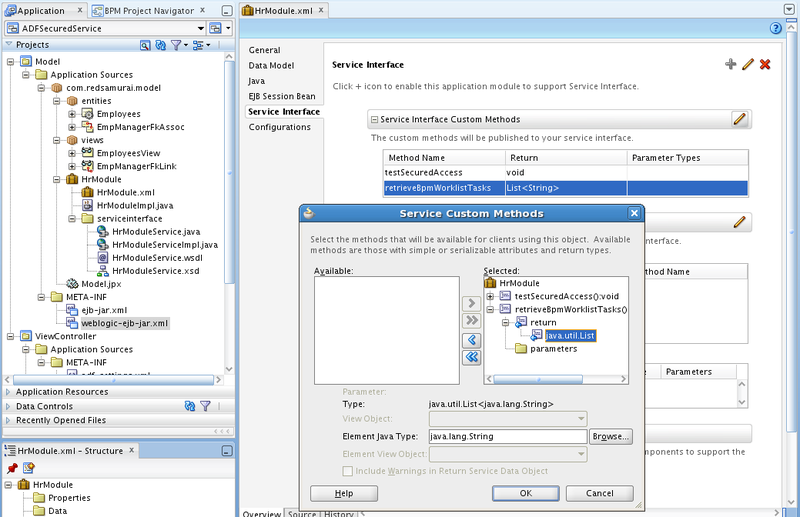 Or do I need to use the invokeDataControlMethod?! Yes, I don't mean to implement data caching - I'm saying you can find an example in caching blog, about how to call a method and pass parameters.